While Kendall Jenner can do many things, apparently ballet is not one of them. A video was released through Vogue Espana of Jenner dancing around a ballet studio in pointe shoes, which caused some controversy among professional ballerinas. Ballet dancers were offended that their hard work and dedication was portrayed through someone who is clearly not a dancer, because there are so many dancers in the world who would have been a better fit for this video. Other ballerinas were offended by the video and thought that Jenner was appropriating ballet culture. Professional ballerina under the twitter handle of @_acushla took to social media to address her concerns. She tweeted, “The shoot was wrongfully appropriated. Dancers like Misty Copeland or Maddie Ziegler could have been way more powerful or graceful.” In addition, the same ballerina tweeted, “Ballet is such high art and coming from someone who’s spent years in the studio, it’s almost offensive to see Kendall act ‘cute’ in it.” Even well renowned Abby Lee Miller, took offense to this video and voiced her opinion on social media. Miller posted a picture of Kendall from the shoot on Instagram and captioned it: “I don’t make it a habit of commenting on all the dancers that post pics with incorrect technique. I would never get anything else done! But I cannot be a fan of this shoot. There are so many amazing dancers in this world… Kendall Jenner is not one of them!” In other words, Abby wishes that a true dancer was chosen for this ad. 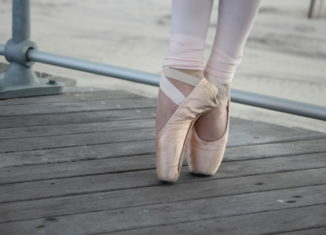 In my opinion, I do not think that either Jenner or Vogue ever had intentions of offending ballerinas. While I do see the viewpoints of the those who were hurt by this ad, I do not see it as something so serious to be this upset about. I guess Kendall will have to stick to modeling for now, but maybe Penelope Disick or North West, both of whom are often spotted sporting tutus, will be the ballerinas in the family!